At the first blush of dawn, it appears to be a normal day in Paducah. The city throws off its slumber and comes to life with the hum of traffic in the streets. On this June morning, however, an unusual sound resonates in midtown. It's the bleating of lambs and goats. In a metal barn on the corner of Carson Park, life stirs among stalls holding prize livestock. In some of the stalls, you'll find young farmers sleeping on cots. These children prepped all spring for the McCracken County Fair livestock shows, and they spent their final night before the big event sleeping next to their treasured animals. Wade Buntin, Show Chairman, and his wife Sue, Show Secretary, make their final preparations before calling the first round of animals to the show ring. They survey the stalls, satisfied with the growth of the shows. "We've been doing this somewhere between ten and fifteen years," says Wade. "A lot of other shows are kind of falling off, but his one just keeps making ground. We get people from all over. We've had them drive up from places like Florida. We don't see any decline in the numbers either. We see it coming up. This is probably the 2nd largest dairy show in the state, and last year we surpassed the Kentucky State Fair in numbers." Wade gives the credit to the McCracken County Fair organizers. "We try to show the folks who come here a good time. People leave and talk about how good they were treated. The Kiwanis make them feel so welcome and treat them well. I can't give them enough credit. And that word gets out there, and people want to participate." The Buntins see shows such as these as a means of shaping the lives of young children. "The kids are what we try to emphasize. That's our future. These animals are valuable tools for them to grow up with. They get an education that can't come from a book or the internet or anywhere else. They learn responsibility and to value life. Children need these lessons. These animals are important, and we treasure them. Our fairs may one day be like zoos: the only place you'll see these animals." Both Wade and Sue know the value of raising livestock. "I got into it when I was nine years old. She did when she was ten. So we've done this most all our lives." 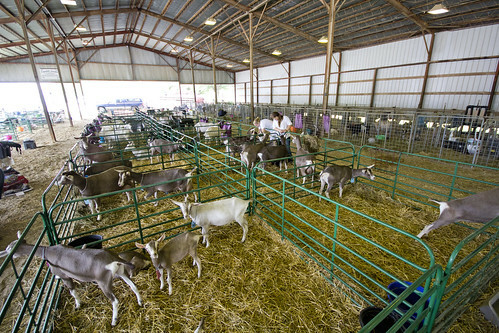 The pair raise dairy goats among other animals on their Crittenden County farm and compete around the country as well. Their travel trailer is adorned on the inside with hundreds of ribbons from all over the nation. And those are just the Grand Champion and first place ribbons from 2013. They will take those down before hitting the road this year and replace them with a fresh crop. "I'm 74, she's 75," says Wade. "Now that I'm retired, I don't think I'd last long if I didn't have this. It keeps us going. It keeps us busy. It still teaches us so much about life. 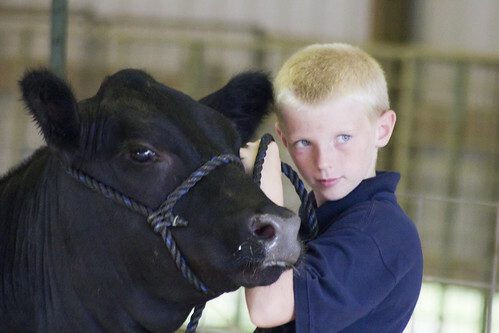 "We've seen a lot of great kids grow up, coming through the McCracken County Fair year after year. We couldn't stop if we started mentioning them all. They are learning what I have over the past 64 years." Wade and Sue work nearly year round to make sure the show is one of the best in the state. "As we travel, we keep our eyes out for the best judges to bring here. We have some good ones this year. One new judge is coming up from Georgia. I've watched him in Florida, Georgia, and Tennessee. When I am out, I am watching. And I pay special attention to how he handles the children. We want them to enjoy it and for it to be a positive experience for them." The attention to detail and quality along with the Buntin's passion continue to foster growth. "People who come here go and tell others. They recruit more for the next shows. I think this year will be the biggest we've had. We may not have enough room!" Livestock shows include American Dairy Goat Sanctioned, dairy goat, beef cattle, junior market goat, youth market lamb, and Myotonic Goat, or, as Mr. Buntin describes, souped-up fainting goats. The full schedule can be found at mccrackencountyfair.com.